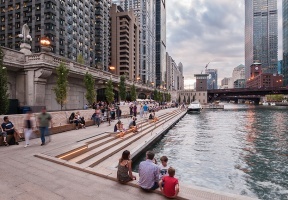 Mayor Rahm Emanuel announced that 985 acres of parks have been acquired and 5.5 miles of waterfront access have been developed under the Building on Burnham plan. 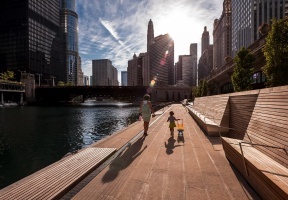 The comprehensive plan to invest in the Lakefront, the Chicago River, natural areas and recreational opportunities in neighborhoods across the city will continue, with plans to acquire additional parkland and further develop the waterfront in the coming years. Building on Burnham, which launched two years ago, outlined a comprehensive plan to invest in public spaces across the city. Construction is currently underway at the 312-RiverRun, a nearly two-mile recreational hub connecting the Irving Park, North Center, Avondale and Albany Park neighborhoods to three parks with one path. Once complete, the project will provide North Side residents with direct access to a network of recreational amenities that includes wheelchair accessible baseball fields, fitness centers, playgrounds, an indoor ice skating rink, tennis courts, outdoor pool, boat houses and more. Building on Burnham also builds on the environmental protections and sustainability initiatives Chicago has undertaken since 2011, including closing the last two coal fire power plants operating in urban America. Here, the planned El Paseo Trail through Pilsen and Little Village is underway including a roadmap for producing affordable housing along its length. An interactive map with Building on Burnham projects can be found at http://bit.ly/BurnhamMap.